Ask 100 of your (distracted) co-workers how their NCAA basketball tournament picks are holding up and 98 will tell you they got “blown up” this year thanks to all the “F’n upsets!” The other two are probably lying. How can that be? Two of the Final Four teams are #1 seeds (Villanova and Kansas) and the third is well-regarded University of Michigan, a #3 seed. Okay, not many of them foresaw unheralded Loyola of Chicago (a #11 seed) surviving into the final weekend of the tournament—only the fourth time in history a #11 has done so well. But, other perennial “blue chips” teams like Duke, Purdue, Syracuse and Florida State had deep runs through the March Madness gauntlet. So, why all the bellyaching about upsets? “The process of filling out an NCAA Basketball Tournament bracket is ultimately like constructing an investment portfolio,” Evan Powers CFP® observed in myFinancialAnswers. “You’re trying to find the right balance between the ‘safe’ picks (top seeds, blue-chip stocks) and the ‘upset’ picks (lower seeds, growth stocks); crafting a ‘unique’ bracket that you think can outperform your coworkers (or ‘the market); even making picks that will make us feel good when they work out well (picking our alma mater’s team, or values-based investing). As the old saying goes: “Past performance is no guarantee of future results.” For example, Powers’ alma mater, University of Virginia, was the #1 overall favorite in this year’s tournament. How’d they do? Despite being 20-point favorites over their first round opponent, University of Maryland, Baltimore County (UMBC), Virginia didn’t just lose to the 16ht-seeded Terriers and their 5-foot-8, 140-pound guard K.J. Maura–they got blown out by 20 points! UMBC’s Cinderella run ended abruptly in the next round, but they made history—it was the first time in tournament history that a #16 defeated a #1. Then there’s the University of Loyola-Chicago Ramblers, lightly regarded a #11 seed, that hadn’t appeared in the NCAA tournament for over a decade. The fact that Loyola made it to the Final Four this year “befuddled all but the less one half of one percent of the more than tens of millions of ESPN bracket players who picked them to advance this deep into the annual contest,” observed Bill Kelly, CEO of the Chartered Alternative Investment Analyst Association® (CAIA) and author of the All About Alpha blog. It’s only the fourth time in tournament history that a #11 seed has advanced to the Final Four. “Assuming there is some information advantage here, and this group is the closest proxy to expertise, it’s no wonder that the experts sometimes look and feel very foolish,” added Kelly. Whether investing or filling out tournament brackets, following the herd simply means following the trends. Despite a stellar year for hedge funds in 2017, Kelly said many of the big managed futures funds quite happily followed the longer-term equity trends right over the sizeable February speed bump” which is reflected in the disappointing YTD numbers. “Is this the time to lock in losses or take a pass based on a one-month composite index? If so, the investor may resemble the many NCAA bracket players who are now on the sidelines wondering how so many seemingly inferior teams have risen to dominance amid So Much March Madness,” lamented Kelly. 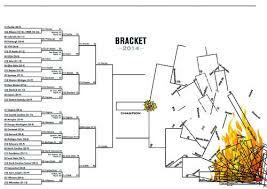 According to Powers, “the biggest mistake that people tend to make when filling out their brackets is picking too much “chalk”, or highly-seeded teams. People confuse the most likely individual outcomes with the most likely aggregate outcome. With 63 games in a high-pressure single-elimination tournament, “there’s basically no way that all the top-seeded favorites will win every game,” noted Powers. “Remember, there has only been one year in history when all four #1 seeds advanced to the Final Four, as compared to three years when none of the top four did. That’s not a bug, it’s a feature,” added Powers. No wonder Warren Buffett didn’t break a sweat when he once offered a $1 billion prize to anyone who could pick a “perfect bracket.” He knew it was mathematically impossible to do so. He also knew that America’s predilection toward picking the favorites would cost them dearly and actually make it even more unlikely that they would pick the perfect bracket. Did anyone beat the odds? Heck no. Not a single one of the tens of millions of players who participated in the contest survived the first weekend of the tournament with their brackets intact. In the same way, constructing a portfolio comprised only of blue-chip stocks is probably a bad idea, explained Powers. In a 2014 analysis, the biggest market cap stocks in the S&P 500 were Apple, ExxonMobil, Microsoft, Google, Johnson & Johnson. “While a portfolio consisting only of those 5 names (in equal weights) would have earned a solid total return of 14.8% in 2014 (aided mostly by Apple, which clocked a 40.6% return; 2 of the 5 actually would have lost money), their performance was barely distinguishable from the overall market average,” said Powers. Our Take: As in the March Madness tournament, anyone can be a winner on any given day. It’s like when a scrappy, thinly-traded IPO (think Loyola or UMBC) outperforms an S&P 100 global behemoth (think Virginia, Miami or Tennessee)—in the same industry. In Part 2 of this post, Topley will explain how the most common psychological mistakes made by investors are also made by the millions who fill out their NCAA tournament brackets every March. Hint: “It’s a psychology game, not an IQ game,” Topley told me recently. Amen to that—and to Sister Jean!